Peter was on parish supply at Apollo Bay last weekend and did not turn up for Mass. He was found, collapsed, on the floor of his room. He was taken to Geelong hospital. Steve Dives writes: It is with great sadness that we inform you that our dear brother Peter Wood passed away very peacefully this afternoon at St. John of God Hospital, Geelong, Victoria. His two brothers and family surrounded him with love as he passed away. We will advise when His Requiem Mass will be; at this stage it is intended to be at St Bede’s North Balwyn Parish, Melbourne and burial at Douglas Park MSC cemetery. Peter was born on 2nd May 1941, a Melbourne boy. He did a degree in architecture and practised professionally in London. Later he would design the MSC community house at the Pacific Regional Seminary in Suva. 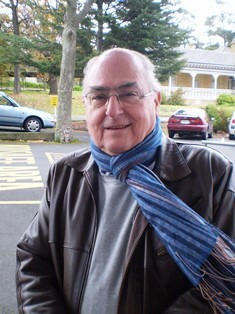 Peter worked as a lay missionary in Papua New Guinea, entered St Paul’s National Seminary in 1972. He made his first vows on January 7th 1978 and wa ordained in his home parish church of St Bede’s Balwyn where his funeral Mass will be conducted. In his 37 years of priesthood, Peter served in a wide range of ministries including in Darwini and Suva, heading the newly-established AIDS ministry in Melbourne and then in the NT. He was parish priest of Moonah, chaplain at Monivae and, in recent years, available for parish supply in the Ballarat diocese, based at Monivae.